Nerea graduated with honors from West Point in 2006 with a B.S. in Comparative Politics. 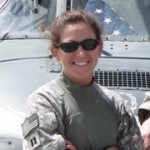 She was commissioned as an Aviation officer and attended flight school, receiving her rating as a UH-60 Blackhawk pilot. She has served in a variety of leadership and staff positions and deployed to both Iraq and Afghanistan. While stationed in South Korea, she also designed and implemented the Iron Brigade&rsquo;s Women&rsquo;s Mentorship Program, a mentorship program designed to encourage positive social and professional relationships among female Soldiers in the Brigade. Most recently, she commanded an Air Assault Blackhawk Company in the 82d Airborne Division and was awarded the MacArthur Leadership Award. Currently, Nerea is a Master&rsquo;s student at the Jackson Institute for Global Affairs focusing her studies in International Relations, Security, and Development. After completing her studies, she will be assigned as an International Relations instructor in West Point&rsquo;s Social Sciences Department.